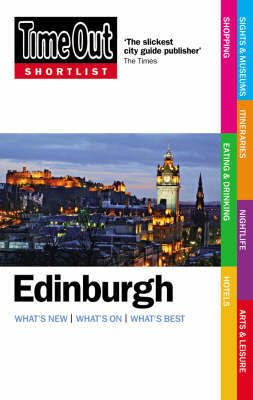 The Time Out Edinburgh Shortlist includes all essential visitor information, presented in a way that is designed to take you straight to what you're looking for: reviews of Edinburgh's classic sights and venues in area-by-area chapters, maps with all entries pinpointed, customised itineraries and visitor basics, all illustrated with specially commissioned photography. To help you make city-wide choices, the Time Out Edinburgh Shortlist includes critical and useful venue selections in a variety of fields - our Shortlists. Time Out Shortlist guides will take you straight to the best during any trip, but they're particularly good for short breaks or repeat visits, when it's important to be directed straight to the best and most current, with no time wasted - and at GBP7.99, they won't waste your money, either.